2018 FAC Print Award winner Deanna Hitti next to her work TOWLA. 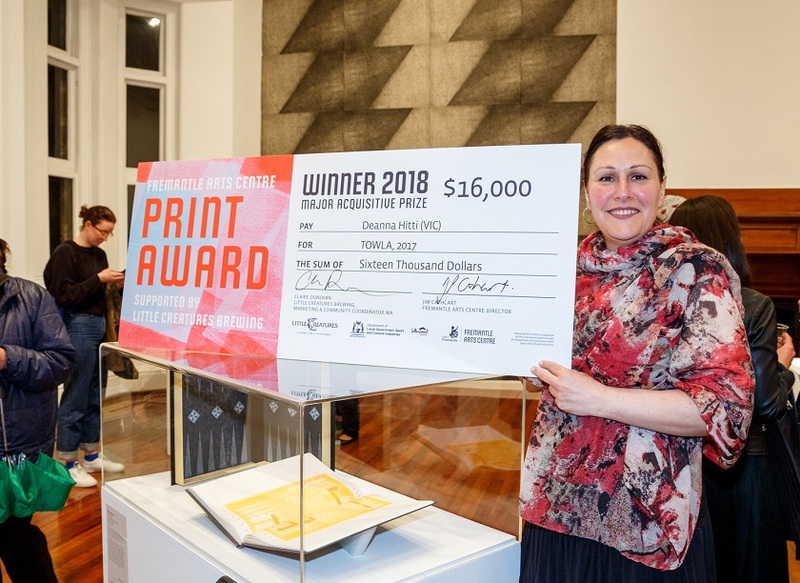 The Fremantle Arts Centre Print Award is Australia’s premier showcase of prints and artists’ books. The award and exhibition, which have been running for more than 40 years, boast a national judging panel and $22,000 in prize money. The FAC Print Award presents the best works from established, emerging and cross-disciplinary artists. Applications for the 2019 FAC Print Award are now open. The Award is open to all artists living and working within Australia. Individuals are invited to enter one print or artist’s book only, using any printing process. The entry is to be the work of the entrant and must have been made during the two years preceding June 2019. Prints in multiple parts are acceptable but must be considered as a single work. Applications close 5pm, Fri 24 May. If you have any questions relating to entering, please contact FAC Print Award Coordinator Emma Buswell. Each year the FAC Print Award winner is announced and the exhibition of all the finalists’ work opens in September. In 2019, the exhibition opens 6:30pm Thu 19 Sep and runs Fri 20 Sep – Sun 10 Nov.